Summary: Rose offers an in-depth portrait of a writing project teacher integrating the study of science and language arts in her first-grade Baltimore classroom, all while advancing and honoring the cultural knowledge and understanding of her thirty African American students. This chapter, “Baltimore, Maryland” from Rose’s Possible Lives, not only highlights curriculum development, but also offers a model for integrating student dialogue and student work while writing about classroom learning. At a time when multiculturalism and race-conscious curriculum have become such hot-button issues—and the culture war polemics around them generates more heat than light—this teacher’s work represents the rich and layered possibilities of such an approach. Race is at the center of Stephanie Terry’s pedagogy, in the books she selects, in the environment she creates in her interactions with students and parents. But the centrality of race does not lead to an exclusionary course of study. Ms. Terry incorporates much from a range of sources—Dr. Seuss to Venn diagrams—into her curriculum. 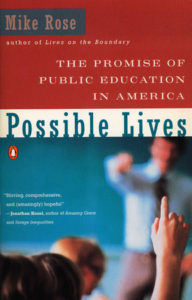 I also include this chapter because it illustrates…a key dilemma, both a political and rhetorical one: how to represent the opportunity opened up by good teaching (or social intervention) while simultaneously representing the terrible threat to opportunity posed by a history of discrimination and poverty, how to insist on the possible while being clear-eyed about the devastation of inequality. “Baltimore, Maryland” from Possible Lives by Mike Rose. Copyright (c) 1995 by Mike Rose. Used by permission of Houghton Mifflin Company. All rights reserved.